"Commonly known as the Coca- Cola Games, the newly agreed part­nership saw Coca-Cola increase their sponsorship by over $300,000 to bring the total sponsorship to $1 million." The Fiji Secondary Schools Athletics Finals received a major boost when the Fiji Secondary Schools Athletics Asso­ciation renewed their partnership with Coca-Cola for another five years in Suva yesterday. Commonly known as the Coca- Cola Games, the newly agreed part­nership saw Coca-Cola increase their sponsorship by over $300,000 to bring the total sponsorship to $1 million. “Majority of this is in cash com­ponent,” said Coca-Cola Amatil Fiji marketing manager Lawrence Tikaram. 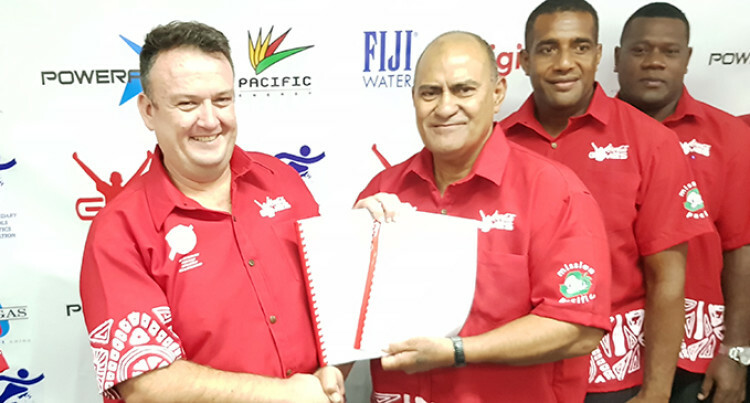 Coca-Cola Amatil Fiji general manager Roger Hare said it’s great to renew their partnership with the FSSAA. “For us this is an exciting day with our association with the Coca-Cola Games,” he said. Hare said it has given Coca-Cola another great platform for the next five years where their assistance is not only for the nationals but for the zones as well. He pointed out their new agree­ment is a big commitment on their part but it is something they are proud of. FSSAA president Ratu Marika Uluinaceva said they are grateful to Coca- Cola for their sponsorship for the past years and again for this year onwards. “This year it’s going to another level where we are going to support our zones more so in that way the athletes could prepare better for the Coca-Cola Games. “We are also looking forward to better results as well,” Ratu Marika said.